Submit an Online Application, once approved, you will receive an invoice and can make an online sign payment or mail a check to the address on the invoice. The electronic downtown sign is programmed, maintained, and administered by VOLUNTEERS. 100% of sign revenue is kept in an escrow account for future repairs and maintenance. The nominal cost charged to advertise on the sign for Non-Profit Groups, 501(c)3’s, Churches, and Community Organizations is to help ensure that this valuable resource will be serving the community for years to come. Additional donations to this fund can be made by contacting the Rotary Club of Apopka directly. 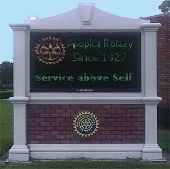 In keeping with Rotary’s values (Is it the TRUTH, is it FAIR to all concerned, Will it build GOODWILL and BETTER FRIENDSHIPS, Will it be BENEFICIAL to all concerned), this sign will be used to communicate beneficial information to the Apopka community including community announcements, events, and recognition for extraordinary service. An application must be submitted a minimum of 2 weeks prior to requested display date in order for the signs to be produced and displayed. The maximum time for display of a sign is 2 weeks. It may not be possible to always display signs on the exact date requested. Submissions will be accepted on a first come first serve basis. Political, commercial and non-community event advertising will not be permitted. The Rotary Club of Apopka reserves the right to deny any application or edit sign content based upon indecent, obscene, inappropriate content, or any reason determined by the sign committee.